There are many cat eye problems. 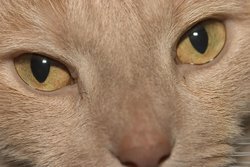 This article will help you identify some of the most common eye problems in cats. It will also give you several tips to help you prevent them. If not treated, lesser feline eye problems may become quite serious. So it is important to check you cat’s eyes on a regular basis and be on the look out for any sudden changes. The information presented here is for educational purposes only. Always consult a vet if you believe your cat is sick and/or has an eye condition. Bulging Eyes. Tumors and abscesses can cause a bulging eye. Glaucoma is another common cause. Cat Pink Eye. Also known as cat conjunctivitis, this is one of the most common cat eye problems. Feline conjunctivitis causes redness and swelling in the eyes. One of the most common causes is the feline herpes virus. It can also be caused by bacterial infections. Cloudy Eyes. Cloudiness in the eye can be caused by several conditions and infections, including keratitis and uveitis. This eye disorder is usually very painful. Cataracts, a condition that also causes the eyes to lose its clarity and transparency, are not painful. Color Change. A change in eye color could be a symptom of melanoma, a form of cancer. Color change may also indicate that the cat has jaundice. Dry Eye. This disorder causes the eye to produce fewer tears. The cause of this condition is not known. Doctors believe that some factors that may cause dry eye include: the feline herpes virus (keratitis), injuries to the eye/tear duct, and allergies. Eye Infections. If left untreated, eye infections can become serious chronic conditions. The most common symptoms of feline eye infections are inflammation and redness. The feline herpes virus 1 and the bacterial infection known as chlamydiosis are the most common causes of eye infections in cats. Feline panleukopenia can also cause eye infections and lesions in the eye. Feline Glaucoma. This is a serious and very painful ailment that causes the cornea to become cloudy. Pressure in the eyeball also enlarges the eye. 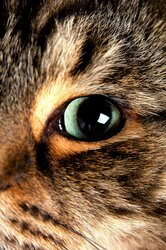 Feline glaucoma may cause partial or total loss of vision. Keratitis is the irritation and swelling of the cornea. It also dries the cornea. Retinal Disorder. This disease causes light sensitive cells to deteriorate. This in turns may cause partial or total blindness. Uveitis. A serious condition, it causes inflammation of the uveal tract (pigmented area of the cat's eye). This condition can cause blindness. Watery Eye. Allergies, irritation, and infections can cause an increase in tear production. Cataracts, conjunctivitis, and glaucoma can cause chronic watery eyes. Does your cat have a cat eye problem? Check your cat’s eyes on a regular basis. Keep the eye area clean. Trim any extra fur if necessary. If you have to clean your cat's eyes, you may use pet eye wipes which you can find at any pet store. Make sure your cat is vaccinated. If you suspect your cat has an eye problem consult your vet immediately. Luckily, many eye problems can be successfully treated with drops, ointments and other medications. But please don’t wait. Minor problems can turn into serious ones quickly. Cat Health 101 - A website filled with information, tips and advice on different aspects of your cat health, helping your cat live a healthy life.